Xbox’s on-demand games subscription service Game Pass has proven successful since its launch last spring, and now the company is looking to expand the service to better serve its audience. 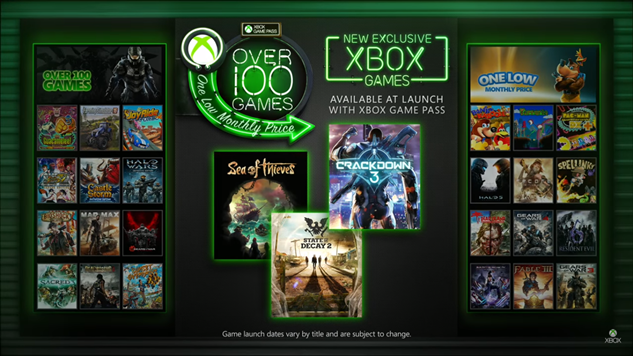 Today, Xbox announced that Game Pass will now provide subscribers with first-party Xbox One titles on the same day as release. “We know our fans value having a variety of games to play at a low monthly price. We’ve also heard from fans that the ability to play new blockbuster games in Xbox Game Pass is important,” said Head of Xbox Phil Spencer. The service already offers over 100 titles, but now it will include all Xbox One games developed under Microsoft’s litany of studios. The first title available under the expansion will be Rare’s Sea of Thieves, which releases on March 20. Crackdown 3 and State of Decay 2 will also be available to subscribers when they (hopefully) release later this year. The service will also allow players to purchase titles for permanent download at a discounted rate, as well. “We are giving fans more choice and value in how they discover and enjoy games—purchase games for their permanent library or play through Xbox Game Pass for one low price,” said Spencer. If the expansion proves successful, expect to see forthcoming Halo, Forza and Gears of War titles arriving on the service in the coming years.